Clean, peel potatoed, cut into fourths. Put in a pan along with some salt and bay leave, cover with water and boil until ready. Drain. Add butter, season with salt and mash potatoes. Stir in egg. Mix in parmesan, if using. Sift the flour into potato mixture, combine into a soft dough (add some more flour if the dough is too wet). Grease the baking paper (to suit your baking tray). Roll the dough out on this paper. Put in a freezer for 5-7 minutes (or in a fridge for 15 minutes). Meanwhile, prepare the filling. Slice mushrooms and onions, fry on a medium-high heat in a mixture of oil and butter (you can do it in a one large frying pan, but don’t mix it-put side by side and fry). Stir 1/3 of the cream into mushrooms, and season to taste. Set aside. Add some butter into the same pan and chopped spring onion (reserve some for garnish, optional), saute for 2 minutes on a low heat – you only need to soften the onion. In a bowl, mix fish with the remaining cream, sautéed spring onion and nutmeg, season to taste. Sprinkle crust with breadcrumbs. Bake it without filling in a preheated 180C oven for 15 minutes. 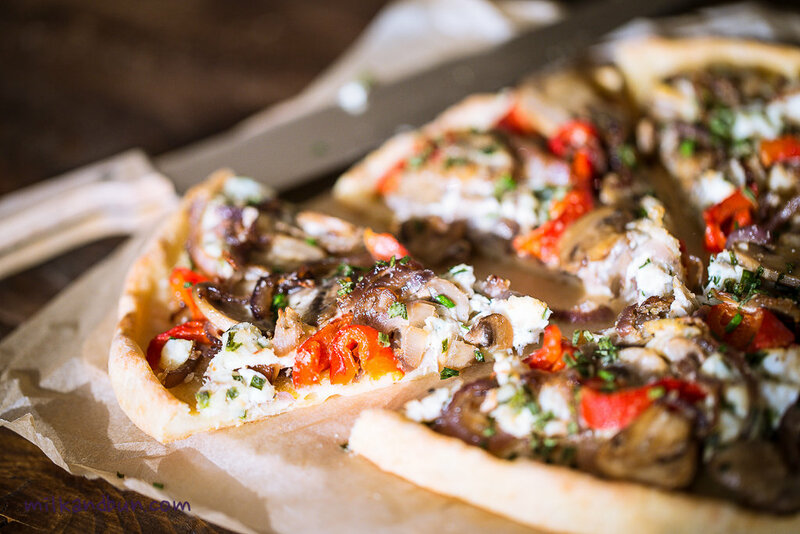 Spread onion, fish, mushrooms and pepper slices over the crust. Bake for 15-17 minutes more. Sprinkle with remaining spring onion (optional). Serve warm. Jan29January 29, 2016 • By milkandbun • This entry was posted in Appetizer, Baking, Fish and Seafood, Midweek Meals and tagged Blogging, cooking, delicious, DIY, fish and bell pepper pie, food, food photo, food photography, food styling, My Life, open pie, pizza, potato crust for pizza, potato pizza, recipe. Bookmark the permalink. An unusual pizza crust, but so delicious. I love anything that has potatoes in it and, of course, l love pizza. An excellent recipe! It wasn’t a plan to make pizza, but I liked what I’ve got 😀 Thanks a lot for the liking, Daniela! Have a nice weekend ahead! This pizza sounds delicious. I think it would go well with my soda. I look forward to our joint participation in the party, and no doubt I’ll be seeing you around. Have a lovely weekend. You are always so creative, Mila! This new dish is wonderful! I am always looking for new ways to make a pizza, and I love your combinations of ingredients here! Potato AND pizza? SIGN ME UP! Looks so delicious and I’ll have to bookmark it for pizza night for sure! thanks for sharing at FF! I was surprised too how it’s good! 😀 Thanks for visiting my blog! Have a lovely week too, Loretta! This looks exceptionally delicious. What a great idea! I have never thought of adding potato in the crust of a pizza. Awesome recipe! Thank you for hosting FF. Having fun! Wow this looks like my idea of the perfect pizza. Those toppings… favorite!! Actually, I’m not a fan of seafood pizza, but here I liked everything too)) may be because of the crust.. I could have this delicious pie anytime! Happy FF! What an unusual crust! When I was in Korea, my colleagues would get pizza with a sweet potato stuffed crust or pizza with a piped sweet potato filling. I wasn’t really a fan but I like the concept of yours – especially since it’s ordinary pizza – it feels like it just would work better. It certainly looks better! Thanks for hosting! Thanks for stopping by my blog. I’m glad you stumbled upon me as well. You have a wonderfully fun blog as well! This pizza looks divine! We are a pizza fan family, and would love this creative version. Yum! My family loves pizza. We have pizza at least once a week. I love the toppings and crust; very interesting combination. I wouldn’t have thought of this but it looks delicious !! Thank you for visiting, Nicole! Hope your visit wasn’t the last!